If eating is your thing (and whose isn’t it?! ), then Canton, Michigan is the place for you. Canton offers a wide range of traditional restaurants as well as unique specialty restaurants that can only be found in our great community. Whether you are new to Canton, or you have lived here for years, you will want to check out this list of some of the best restaurants in Canton. While there are plenty more great restaurants to visit, this is a quick list of some of our favorite places to eat. Somer Restaurant features Mediterranean and Middle Eastern food that has quickly become a favorite by locals and those passing through. Somer is known for taking traditional foods and adding their own spin to make them truly one of a kind. Everything from the falafel to the baklava is made fresh and stands out from the rest. As an added bonus, the portion sizes are generous and the prices are affordable making this a great place to get good food with groups of friends and family. If hearty American cuisine matches your taste a little better, then we recommend Basement Burger Bar. This BYOB (Build Your Own Burger) style restaurant starts with a well-seasoned, well-cooked burger of your choosing and lets you then select your bun, spreads, cheese, toppings and more. You can keep it traditional with a standard cheeseburger, or you can go wild with toppings like grilled pineapple, egg, peanut butter or mac n cheese. The toppings are endless as is the drink selection. The restaurant partners with a Michigan brewery to make available a long list of draft beers. 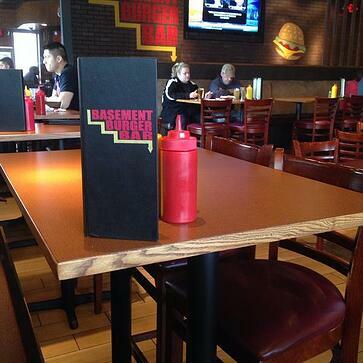 For a good burger and drink, we recommend Basement Burger Bar. Neehee’s is a quick service restaurant serving Indian street food. The menu is unique and guaranteed to please. We would recommend our favorite dish, but each item is equally delicious! Neehee’s is a great option for the health conscious individual as their menu is filled with vegan and vegetarian options. Because this place is so popular, the tables fill up fast. The ever-busy restaurant is a testament to the popularity of this eatery with the locals. If you have a hard time deciding between pizza or Indian cuisine, why not have both? Curry on Crust is an Indian Style Pizzeria offering you all of the flavors of Indian cuisine but on a fresh baked pizza crust. Try the Masala Eggplant Pizza or the Mango Paneer Pizza if you don’t know what to order, or you can build your own pizza with their wide selection of toppings. This place is unique, fun, and casual, many of the reasons why we like it. Best China . . . what a fitting name for one of the best Chinese restaurants in Canton in our opinion. While it is often hard to find authentic Chinese food in the United States, Best China is both authentic and delicious. Their traditional noodle bowls are a local favorite, and menu items give a variety of spicy and non-spicy dishes. This restaurant is a little on the small side, so you may want to order take out and enjoy a nice evening dining in with the family! If you are looking for a place to take your family and friends for a few drink and a menu to please everyone, then this Canton, Michigan restaurant is a great place to start. The all American menu offers lots of options and the atmosphere is perfect for larger groups. It is not only a great place for lunch or dinner, but they also serve a hearty breakfast for early risers. With some of the best pancakes in town, we recommend this local eatery for any meal of the day. Who doesn't love a great Italian meal in a casual setting filled with Old World charm? Antonio's Cucina Italiana delivers just that. The menu offers an enormous selection of homemade unique and traditional Italian fare. A few of our favorite dishes are the antipasto salad, eggplant parmigiana, gnocchi with Pancetta and mushroom sauce, and their wood fired pizza, which can be topped with whatever your stomach desires. And do not miss their freshly baked bread dripping in seasonings and butter! For a more upscale and unique dining experinece, we like to visit Black Rock Bar and Grill. At Black Rock, you get to participate in the cooking experience by cooking your meal at your table on a 755-degree volcanic rock! The food is hot, delicious and prepared to your preferred doneness, as you are in control of that! If having to cook your own meal when dining out is not your thing, Black Rock also offers a wide array of menu items that are cooked to order. On special occasions, we like to finish up with one of their "sizzling" desserts, which comes topped with a flaming sparkler!